It's a multi-effect (reverb, etc) digital guitar pedal with a FET preamp, Baxandall tone controls, and master volume. 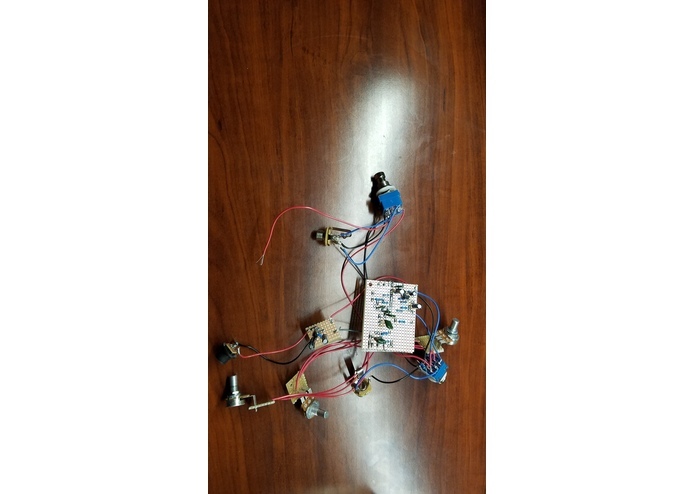 The intent of the project was to create a multi-effect pedal powered by Teensy, an offshoot of Arduino. In addition, we wanted to include a preamp (pre-amplifier, a boost) with tone controls and a master volume. 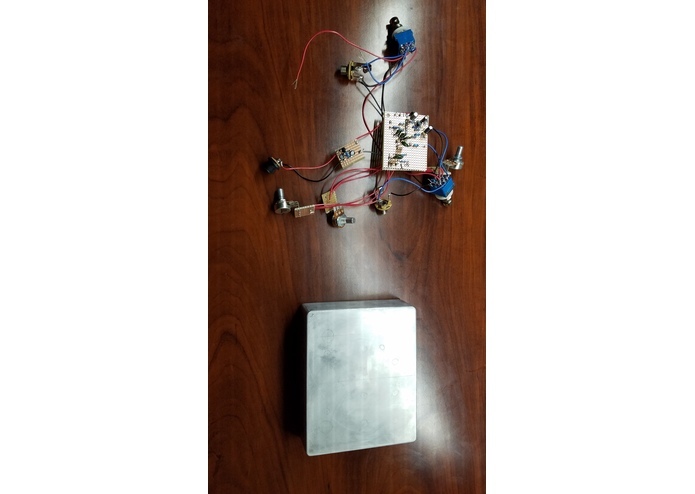 In order to work with guitar signals and the Teensy, we used a Teensy Audio Shield, a shield with an enormous amount of functionality for dealing with audio signals (mono or stereo output/input, specialized effects, onboard DAC). The code was programmed with the Arduino IDE, but we struggled with getting the output to work. As for the preamp section, the goal was to create a FET booster with Baxandall tone controls (treble and bass, very flat at 12:00) and a master volume knob. The FET section was adapted from http://www.till.com/articles/GuitarPreamp/, with the addition of a treble boost/gain boost switch (on-off-on) that would either shunt a small value or large value cap to ground (across the 2.2k resistor coming off of the drain of the J201). 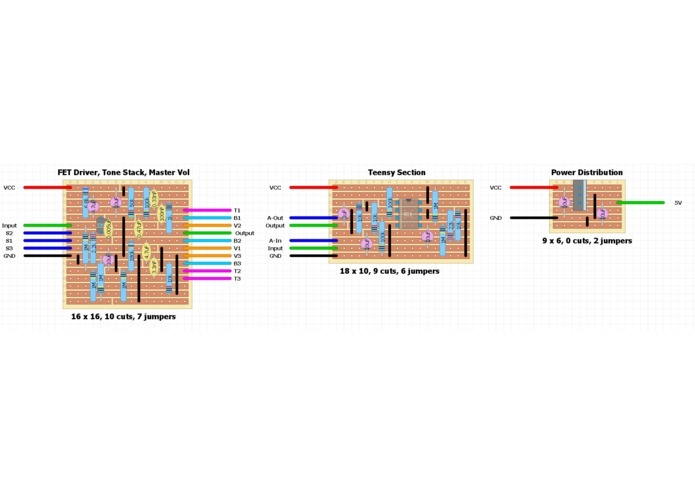 The Baxandall section was adapted from the popular "James" schematic, and we used the stock values from the Tone Stack Calculator (https://www.duncanamps.com/tsc/). Finally, the master volume was adapted from the Fairfield Circuitry Barbershop overdrive pedal, whose schematic can be seen here: http://revolutiondeux.blogspot.com/2012/07/fairfield-circuitry-barbershop.html. The pedal was designed with two separate effect sections in mind, which could be switched on independently or in tandem. In order to get the Teensy section to function (theoretically), we had to use an input buffer for the audio in signal and an output amplifier for the audio out signal. This schematic was adapted from the Sparkfun Programmable Digital Pedal project (https://learn.sparkfun.com/tutorials/proto-pedal-example-programmable-digital-pedal/all). Finally, we chemically etched a hand-drawn design onto the pedal enclosure. 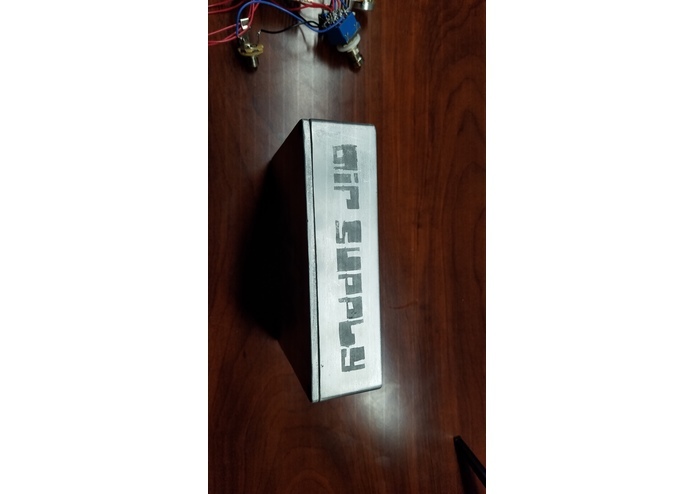 We etched the aluminum with a solution of kosher salt and white distilled vinegar and a 9 volt battery, connecting the positive terminal to the enclosure and connecting a wet q-tip to the negative terminal. Any spots touched by the q-tip effectively corroded, leaving a darker patina behind. In the end, we didn't fully complete our project, but we gained a lot of experience in all our respective fields and will be able to come into the next hackathon better prepared. 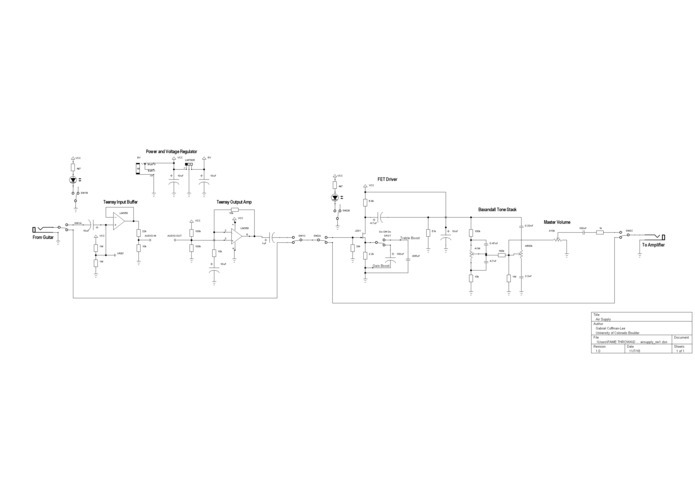 I designed and drew the schematic and the veroboard layouts for the pedal. I worked exclusively with the code, with a bit of help of Dylan. The code was very difficult for us however, and unfortunately I didn't get it to work. I attempted to design software effects for the pedal. 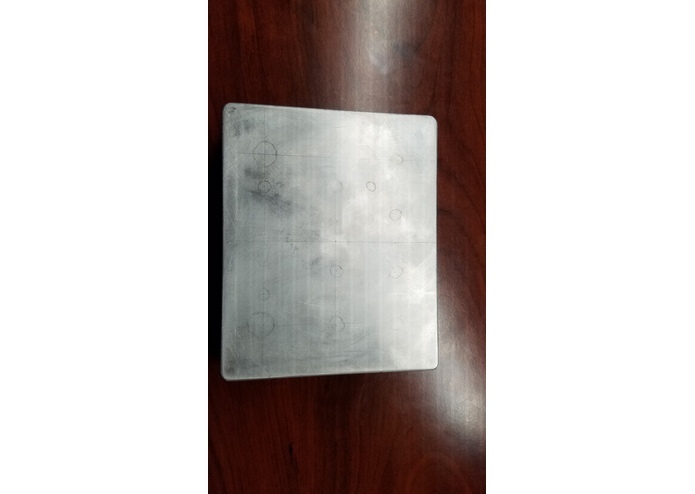 I chemically etched the enclosure with an acetic acid and salt solution and a 9 volt battery. Hand designed art for the enclosure. I worked on a bit o everything. I helped Sri with the Arduino code pin mapping and we failed, I helped Enrique with the enclosure design and we succeeded, and I helped Gabe with the circuitry and prototyping and we had moderate success.